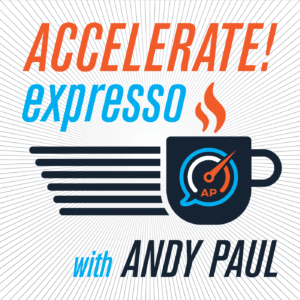 Accelerate Expresso is a weekly round-up show that contains highlights from each conversation from the previous week’s slate of guests on Accelerate! In this episode, you’ll hear excerpts from my conversations with my guests during the week of Aug 14-Aug 18. That’s episodes 540-544. Listen in as I was joined by the following experts: John Rossman, David JP Fisher, Drew Neisser and Katie Bullard. As always, Bridget Gleason was my partner on Front Line Friday. DiscoverOrg: DiscoverOrg’s industry-leading, human-verified sales intelligence gives you all of the data and insights – like direct dials, org charts, planned projects, verified emails, and executive moves – you need to stop wasting time on research and spend more time talking to the right decision-maker with the right message at the right time. DiscoverOrg.com. Gong.io: Gong.io is a leading conversation intelligence platform for B2B sales teams. It helps you convert more of your pipeline into closed revenue by shining the light on your sales team’s conversations. Gong records, transcribes, and analyzes every call so you can drive sales effectiveness at scale. Visit Gong.io. Whalr: Whalr enables a product-based approach to B2B sales, with the Product Qualified Lead (PQL) method. If you sell using a freemium, open source or Trial model then the PQL method is critical to give your sales team visibility into those prospects that are ready to talk. Visit Whalr to see specific PQL examples.